This has Cherry Banana Muesli Recipe has become my favorite plant based breakfast! It’s both nutritious and delicious, and it makes a great Daniel Fast breakfast, too. So often we think of stewardship in the financial sense, that we’re to be good stewards of our money. Let’s not forget that stewardship encompasses many areas, including our health and the longevity of this precious life God has given to us. When we ventured into eating more plant based, unprocessed foods, I struggled with what to eat for breakfast. I’m not much of a breakfast person. My husband is fine with a bowl of plain oats and raisins, but that just isn’t appealing to me at all. When we’ve been on the Daniel Fast in the past, I’ve hobbled through breakfasts for those three weeks, but I knew if this was going to be a way of life for me I needed to figure out this missing link, pronto! Enter my cherry banana muesli. I was tipped to this idea after watching one of Dr. Fuhrman’s Youtube videos, Eat Breakfast With Dr. Fuhrman. Flaxseed meal is so good for you, as researchers have found that it helps prevent and reverse cancer as well as other diseases. Did you know that flax was cultivated in Babylon as early as 3000BC, and one king even required his subjects to consume flaxseed regularly? You can read more about the health benefits of flaxseed, here. In a cereal bowl, add one banana and one heaping tablespoon of flaxseed meal. Mash banana, then add muesli and frozen cherries. Add enough soy or almond milk to thoroughly wet all the ingredients and stir well. Let everything soak together, the grains soften, and the cherries thaw… this will take about 15 minutes. Then you can give it another quick stir and enjoy your nutritious, plant based breakfast! Also, since it may be hard to find, here’s a picture of the muesli I use. You can get similar ones on Amazon here. Let me know if you find this exact one on Amazon, or if you try another one and enjoy it. And here’s a picture of the flaxseed meal I use. You can easily grab this on Amazon, here. Tell me, what’s your favorite plant based breakfast? I’d love to know! 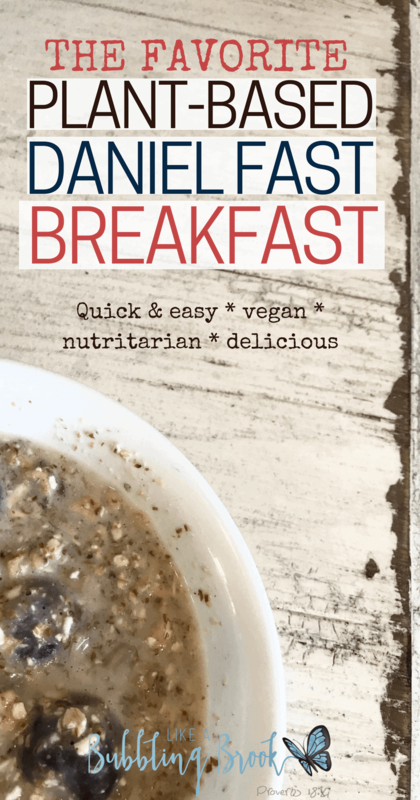 Looking for more Daniel Fast breakfast recipes? You can find all of my Daniel Fast recipes here.